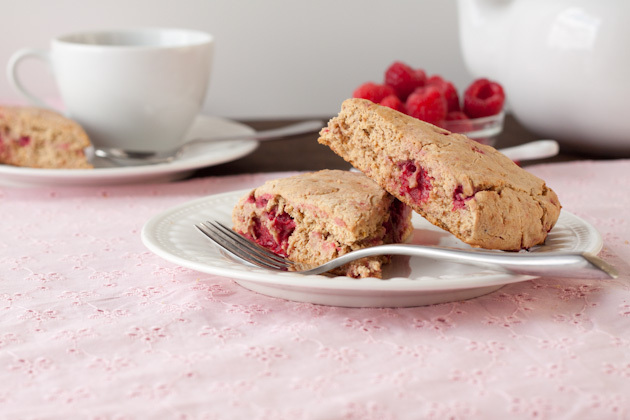 Light gluten-free scones with chunks of fresh raspberries and shreds of lemon zest. Preheat oven to 400F and line a baking sheet with parchment paper or a silicon baking mat. Set aside. In food processor place flour, starch, coconut sugar, cream of tartar, baking soda, ground flax, salt. Pulse on and off to combine the ingredients. Add coconut oil and pulse about 15-20 times or until the mixture resembles coarse meal. Combine the lightly beaten egg, ½ cup milk, vanilla extract and zest. Pour over the flour mixture and process for about 10 seconds. Scrape the dough into a bowl. 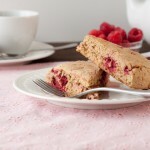 Quickly, but gently stir or fold in the raspberries with a spatula. Sprinkle the baking sheet with a touch of sorghum flour and pat the dough to 8-inch circle, ¾-inch thick. Cut into 8 wedges, keeping the pieces attached. Brush the top with 1 tablespoon of milk and bake for 12 minutes, remove from the oven, separate the wedges and return to the oven to bake for another 10 minutes. Allow to cool on the baking sheet for 5 minutes before transferring to a cooling rack.